Disease has its own vocabulary. It requires the acquisition of new terminology: words like metastases, emesis and hepatotoxicity. 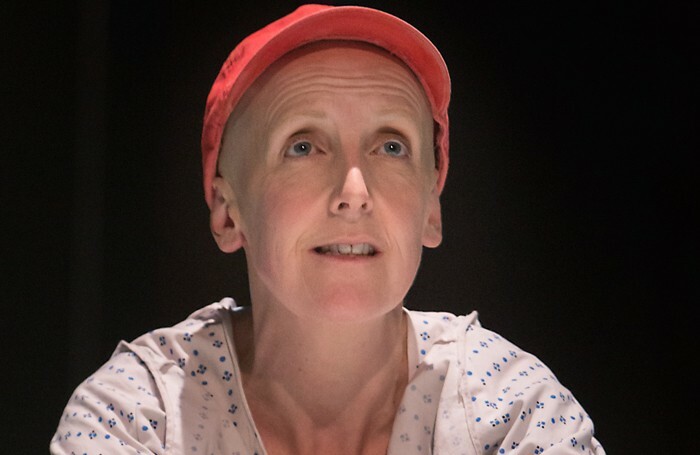 Julie Hesmondhalgh plays Dr Vivian Bearing, a professor of English literature, a specialist in the metaphysical poets and an expert in the Holy Sonnets of John Donne. She is a scholar and extremely proud of the fact, a woman of considerable and formidable intelligence who is accustomed to exceling in everything. She also has Stage 4 ovarian cancer. It’s aggressive. It will win. This makes her a prime candidate for research. As she is subjected to eight cycles of chemotherapy at the highest dose, she is reduced: to a body, a wrapper, a bag, to fluids in and fluids out. 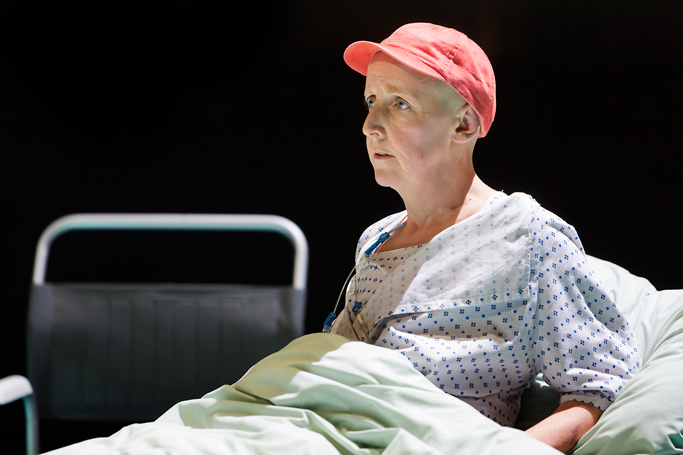 Cancer dulls and uncolours her, it robs her of her hair, her eyebrows and her dignity. “Illness strips you back to an authentic self, but not one you need to meet,” Hilary Mantel has written, and she’s someone who knows about such things. This is true of Bearing. 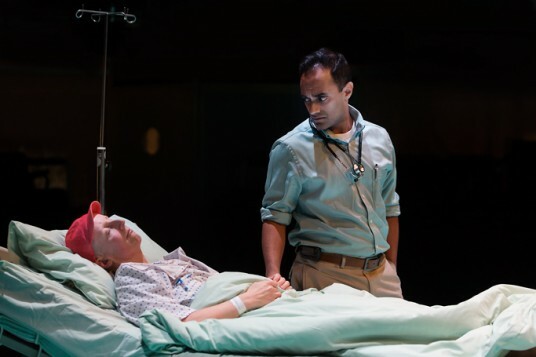 One of the play’s funniest scenes is also one of its most excruciating as she lies splayed on a bed with her legs in stirrups, waiting for her doctor to probe behind, between, above, below. At least she still has poetry, she still has Donne. Though Wit puts its audience through a wringer it is not without humour. Bearing constantly subverts and disrupts the narrative. Most of the time this keeps the play from spilling over into melodrama, though as a piece of writing there are times when it feels a little too neat. It also contains a burst of activity near the end which wouldn’t feel out of place in an episode of ER, but its power is still considerable. Playing out on a revolving disc of insipid, clinical green resembling an agar plate, Shaw’s production works incredibly well in-the-round, the audience looking on like angels or judges, complicit, like a Powell and Pressburger vision of the after-world. 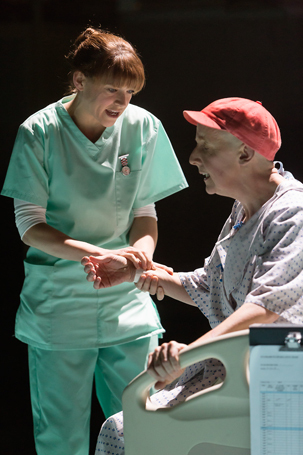 Esh Alladi is amusingly awkward as Doctor Posner, as blunt and single-minded in his own way as his patient, and Jenny Platt brings warmth to the piece as a kind-hearted nurse – because in the end all of us can hope for is kindness, for the touch of someone’s hand ­– but the play belongs to Hesmondhalgh. 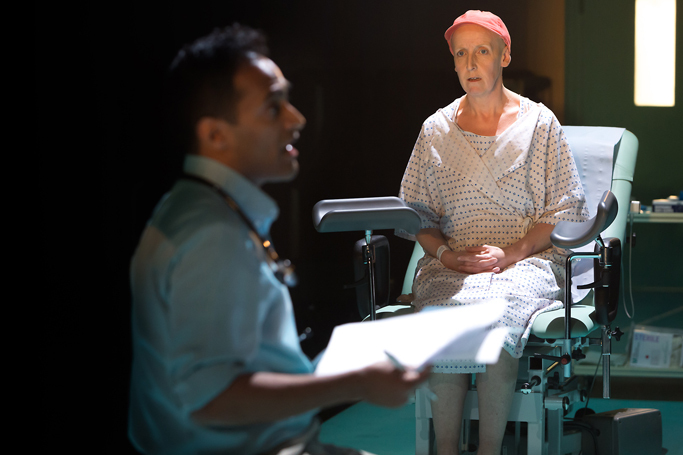 She pitches her performance brilliantly between arrogance, assurance and vulnerability. She’s wonderfully wry even as she is diminished, even as she suffers. 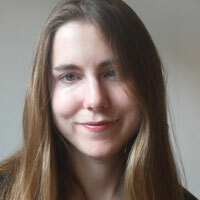 Just like the character she plays, Hesmondhalgh excels. 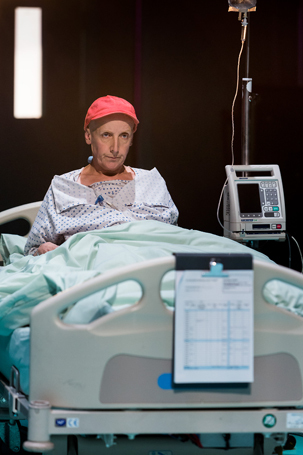 And while there are moments when the production seems a little bit too button-pushing, the last few seconds are about as glorious and cathartic as theatre gets – a release in every sense.